Spy Photos: BMW 1-series tii. Could this be the real deal? The BMW fans went totally crazy when the german auto manufacturer introduced the BMW 1-series tii at the Tokyo Auto Show. The speculations began already and everyone was talking how could this be the real "M1" model. When these spy photos came out two days ago, everyone was wondering if this is the real 1-series tii concept or it's just another BMW 135i heavily modded. What we know is that it's registered in Munich, Germany; it has some very hot non-standard components, carryovers from the tii concept, including the revised front fascia, side skirts, carbon fiber diffuser and matching rear wing. The upgraded brakes(LSD?) are one of the most obvious additions, while the interior, well plenty of Alcantara , from the shift boot to the seats. One thing that is totally different is the steering wheel, covered in suede and complete with three different sections packed with LEDs. I know, lots of questions go through your mind right now and honestly, I don't have the answer to any of them..for now. 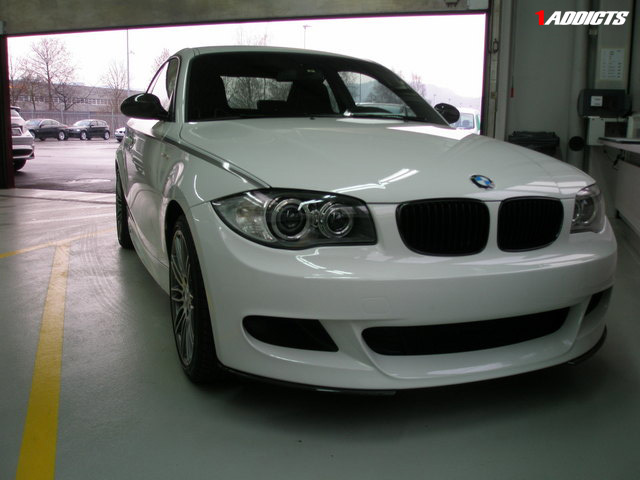 I'm sure as soon as the BMW 135i will come out, we'll see more of them modded in the "tii" style. Previous post BMW 335i might be built in South Africa also? Next post It’s the new MB CLC a competitor for the BMW 3-series coupe?